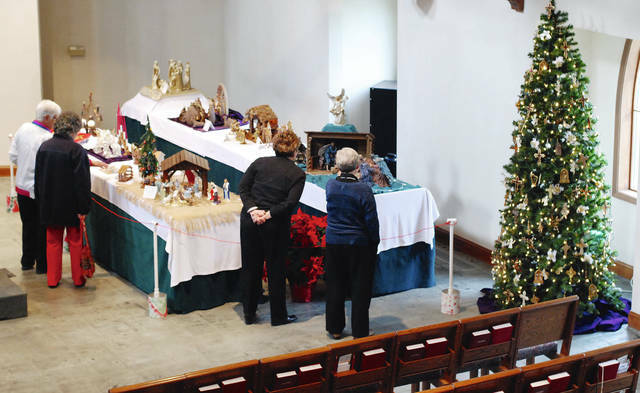 A nativity set is pictured in the sanctuary of Messiah Lutheran Church during a previous year’s No Room at the Inn event. This year’s fundraiser will be held this Sunday. Visitors to Messiah Lutheran Church view a collection of nativity scenes on a table in the sanctuary of the church during a previous No Room at the Inn event. 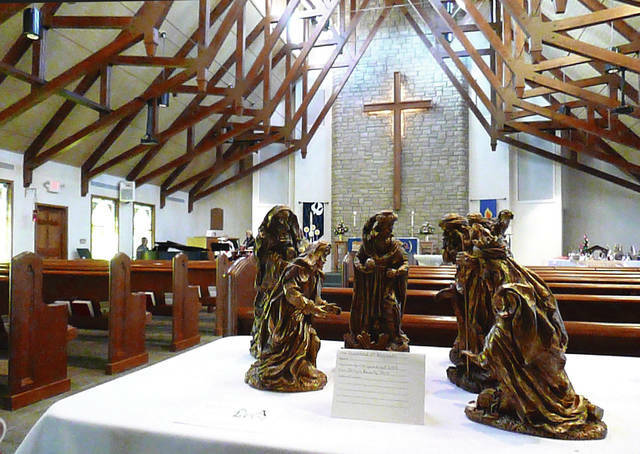 Visitors to Messiah Lutheran Church, at 1013 East Lawn Ave., will see almost 300 nativity scenes from around the world during the church’s “No Room at the Inn” event this Sunday from 12:30 to 3:30 p.m. A Christmas luncheon featuring heavy hors d’oevers and a silent auction ongoing at the same time will raise money for the Caring Kitchen, but admission into the church is free. Last year’s event raised $3,200 for the Caring Kitchen. Henson said that previous years’ events raised almost $5,000. Caring Kitchen Executive Director Marilyn Cohn said that this fundraiser has been a great boost to the operations budget and that the nativity displays are beautiful. Caring Kitchen served 769 meals with over 113 volunteers from the community on Thanksgiving Day. The Christmas luncheon costs $5 for adults and $3 for children under 12, and donations are always accepted. Henson estimated that there were 180 people at last year’s luncheon and as many as 300 people who walked through the church that afternoon. Henson also said there were 280 nativity scenes last year, but that it is impossible to know how many will be available this year until they are set up. Anyone wishing to lend nativity sets to the church for the event may do so Thursday from 10 a.m. to noon or 6 to 8 p.m.; Friday from 10 a.m. to noon or 6 to 8 p.m.; or Saturday from 11 a.m. to 1 p.m. Exhibitors do not need to be present on the day of the event. Nativities should be picked up after 3:30 p.m. on Sunday or by special arrangement. Live music will be played in the sanctuary throughout the event, and at 2 p.m. the Graham High School Show Choir will present a concert. For more information, contact Henson at 937-408-1517.